Franklin and McCain, names to conjure with. They evoke whole worlds on their own. They trigger differing re- actions, now in death as well as in life. They have lain in state, and many, many people – the great and the good, the unknown and the not so good – have queued patiently to pay their last respects. Where to begin? Ladies first. Aretha Louise Franklin, crowned the Queen of Soul by popular acclaim, was an exceptional talent. I have on my computer a recording of the lady herself belting out the anthem My Country Tis of Thee at the inauguration of Barack Obama, the first black president of the United States of America, in 2009. I play it often. It is spine-tingling, inspirational singing, entirely fitting for the great occasion. It’s not just the extraordinary vocal range that marks Franklin out as special: it’s the emotional and spiritual power she conveys. She was a huge presence in more ways than one. Standing on the steps of the Capitol in Washington, she dominated the scene. Looking down the full length of the National Mall, she brought tears to the eyes of many in the vast audience – especially African Americans – as she sang with passion the iconic words “Let freedom ring”. It was a moment of exaltation, a moment to be savoured. That special moment had its roots in America’s black church experience, especially in congregations with the experience of slavery, either lived with or remembered. Who could forget the lynch mobs? The black congregations sang of their hurt, their despair, their resistance and their hope in the face of discrimination and per- secution. A straight line runs from that gospel theology of liberation to Rosa Park’s defiant “No” when asked to surrender her seat on the bus to a white man, to freedom marches and demonstrations, to the greatest public sermon of the 20th century – the Rev Dr Martin Luther King’s “I have a dream” speech in Washington. This was the culture that shaped the life of Aretha Franklin. The daughter of one of the most charismatic of the nation’s black Baptist preachers, the Rev CL Franklin, and his wife, Barbara, singer and choirmistress in her husband’s church. Aretha’s father marched alongside Martin Luther King and ordained the young Jesse Jackson. A singer in her father’s church choir, Aretha Franklin went on to win 17 Grammys and international stardom. She never forgot her roots. 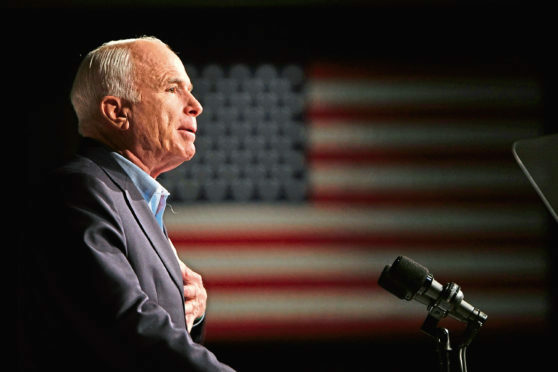 From one great American to another who has been lying in state: Senator John McCain has been much lauded for his bravery and his independence of spirit. In 1967, McCain escaped death in a massive fire aboard the USS Forrestal aircraft carrier in the Pacific. Months later, he was shot down in his Skyhawk jet over North Vietnam and parachuted into a lake near Hanoi, breaking both arms and a leg. Captured by communist soldiers, McCain was tortured and beaten, an experience that left him with lifelong injuries. The experience gave him a profound hatred of torture; in his later political life, he gained enemies by criticising the “enhanced interrogation techniques” used by the CIA on terror suspects. The character of John McCain can be seen in his refusal of an offer of early release from captivity. He declined the chance to go home early until his comrades could also go home to their families. His courage cannot be seriously questioned – though it was called into question by the current occupant of the White House, who said that he preferred people who hadn’t been captured. Senator McCain could be a right awkward customer. He annoyed his Republican party colleagues by refusing to toe the party line on grounds of conscience. He twice made a bid for the White House. One of McCain’s finest moments came during his campaign. A supporter at a town hall event said she could not trust Obama because she thought he was an Arab. In his later years, the maverick Republican senator incurred the ire of Donald Trump by rebuking the president for his too-close embrace of Vladimir Putin. Make America great again? Despite their flaws, Aretha Franklin and John McCain were great Americans who outshone the petulant, diminished man in Pennsylvania Avenue.